It has not been a happy season in Grand Forks. Many have wondered what is happening after missing the NCAA Tournament last year. And they were expecting a good year this year. So far, no good. 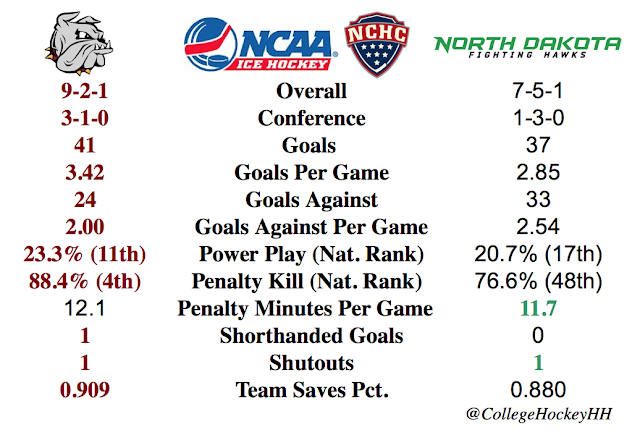 UND is scrambling for wins with five of their seven wins being 1-2 goal differential. Three of the five were one goal wins. This is a symptom of not top scoring, but also fair to below average goaltending and defense. Team save percentage is 0.880 which is far from the benchmark of 90% that we look for in our stat comparisons at CollegeHockeyHH. But this team is never one to take lightly. UND always has talent and replaces talent with talent. It could be a light switch type situation, let's just not flip that switch this weekend. Prediction. Look for a UMD sweep. they are destined to keep pushing for the Penrose Cup and this is one of may key weekends for that goal. Saint Cloud State. Strong team looking to continues its winning ways and making a stake to the Penrose for the second straight year. Returning players are plentiful including goaltenders. What is up next for goals is moving through the NCAAs. Minnesota Duluth. Last year was a pleasant surprise for UMD ending where all the Division I teams want to be, the National Champions. For as good as they became as a team, they come back pretty much still intact and looking for the same success. But it just seems that UMD teams can't sustain success historically to win a regular season championship. Two national championships (2011 and 2018) and the last conference regular season championship was 1992-93. Denver. New coach, lots of new players but look for more of the same as past years. Denver is reloading and likely not rebuilding. Colorado College. Our first "out on a limb" prediction. The Tigers made strides last year with young players and this year return a strong goaltender in Leclerc. North Dakota. A team can only lose talent for so long before reloading cannot continue and rebuilding must occur. This is that year. Miami. The Redhawks at 6 and Broncos at 7 could really go either way. both have limited senior experience on their rosters so this is really just a gut feeling. Also we predict that the future looks brighter for Miami than WMU, but not by much. Western Michigan. See Miami capsule above. The 5-7 picks could really be a toss up. Omaha. The Mavericks have looked outmatched all non-conference. They have some talent, but it looks to be a year of struggles in Omaha. Well, there it is. The predicted finish tot he 2018-19 NCHC regular season. If it holds, it would be the first time North Dakota did not secure home ice and CC hosted in the first round. But for now, it is all just speculation. See you at the Penrose Cup, NCHC!